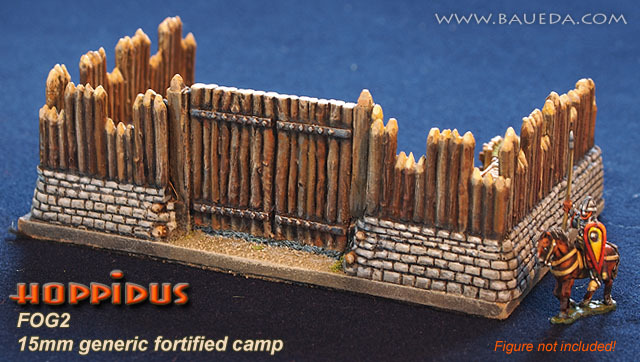 15mm Generic Fortified Camp AVAILABLE NOW! This is a generic ancient fortification based on the classic ditch/embankment and stockade model popularly thought as Roman, but effectively used from Hellenistic times to well up into the middle ages, with only minor differences. 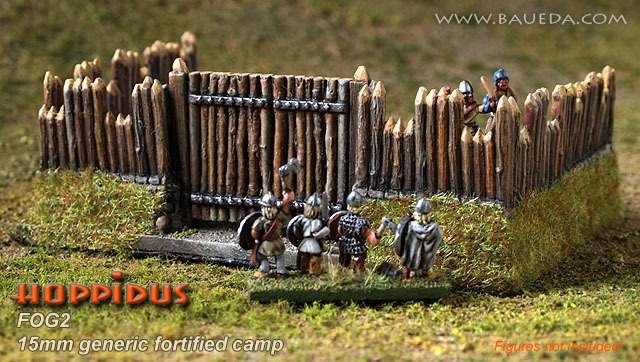 Perfect for a Celtic hillfort, a Norman or Dark Age wooden castle or a fantasy stronghold entrance this set has been designed specifically for being compatible with FOG and DBA family of rules. The complete kit consist of a base formed by two sections of embankment topped by a timber stockade, separated by a full module frontage (40mm) gap, which is closed by a wooden barred gate of the same frontage. The gate can be easily cut in two along the central groove and mounted open or ajar if you prefer. 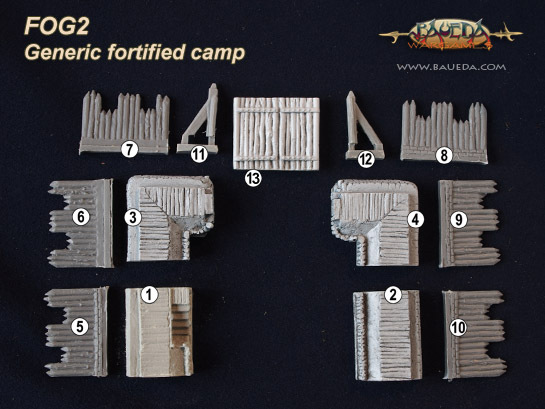 This kit include all the parts required to make a legal 120x80mm FOG camp large enough to hold several elements of troops on the walkway and in the courtyard has plenty of space for baggage, cavalry or artillery. It includes 13 parts in all, assembly instructions and painting examples are available on this page, just click the small thumbnails on the top right. Please note that the kit does not include an MDF base like that shown in the picture. We suggest to use one as it add strength to the model, but it isn't necessary. HOPPIDUS is a truly modular system, and all elements of this set are compatible with the rest of the range. 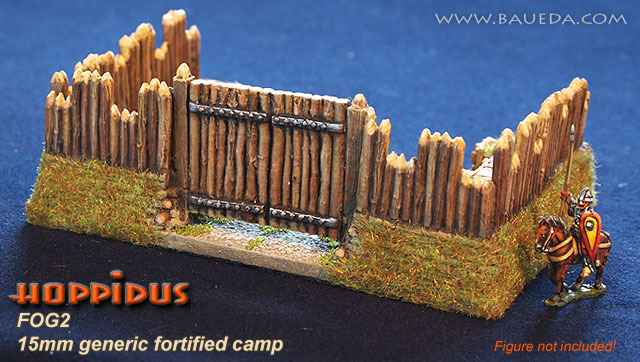 This means you can also add more elements from the complete HOPPIDUS range to expand and customize this basic set, for example adding one or more HOP1 - modular fortifications set, which added to this would let you create a huge enclosed fortified perimeter that can be used for a scenario game or as a large Build Up Area! Just remember you can pick and choose any combination of modules you like, and we're here to help you at any time, so just e-mail us for any special requirements! To order, just and tell us what you'd like and the delivery address, we'll check what we have in stock, calculate the total for you, give you a delivery date and send you a money request via paypal, so all you'll have to do at that point will be to click "accept" if you are happy with it. If you prefer you can also order directly using our convenient shopping cart. 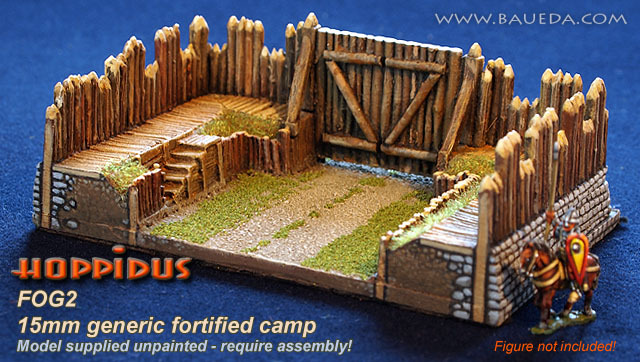 All the products in the fortifications range are supplied unpainted in kit and require assembly. Want this model pre-painted and Ready-to-Play? Click here!